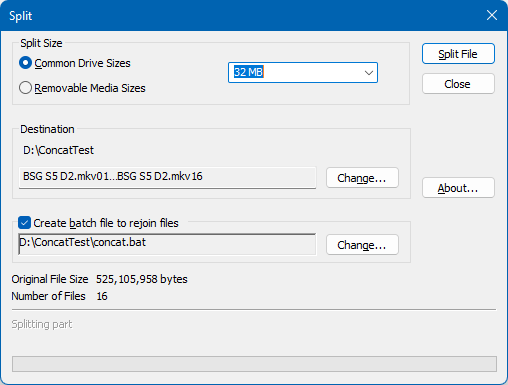 If you've ever needed to break up a large file into several smaller ones, ConCat provides the facilities you need. You don't need to run a separate program to do it, because once you've installed ConCat it's always available right where you need it - in an Explorer right click context menu. Just select and right click the file(s), choose the menu option, and you're there. The split facility lets you break a file into commonly used disk sized (or custom sized) chunks. It automatically names each file section in a convenient manner so that it's easy to re-join them. The concatenate facility lets you join 2 or more files into a single file. It's the Windows equivalent of the copy command. Integrated into Explorer so it's there whenever you need it. Preset options for commonly used removable media sizes. Handles large files (> 4GB). Note that only NTFS formatted disks supports files greater than 4GB. The registered version of Split/ConCat enables extra facilities, such as automatically creating a batch command for use on any machine, and easy file order rearrangement in the ConCat dialog. Note: The concatenate facility will only join raw split files. It will not intelligently join separate structured files such as audio, video, or word processor documents into a usable composite file. If you're using Windows 8, Windows 10, or Server 2012 see the Windows 8/10 items in our FAQ section. Upgrading from a version prior to V5? From V4.1 ConCat loads its UI components (dialog, strings, error messages) from a separate resource DLL (concat.lang). By replacing this DLL with an equivalent one in a different language, the ConCat GUI will display in that language. We don't have the resources to do comprehensive translation work, so we're opening this up to anyone who may want to do this for themselves using their own resource editing tools (such as Visual Studio or Resource Hacker) to edit the resource DLL. Currently we have the following non-English resource files available. Note: These translated resource files will only work correctly with the associated release of ConCat. Download and un-zip the language file (or use your own version). Rename the existing concat.lang file in the ConCat installation directory (normally %Program Files%\JD Design\ConCat. Note that you may not be able to delete it because it is likely to be in-use. Copy the language file to the ConCat directory and rename it to concat.lang. You may need to log off/on for the change to take effect. Start from the supplied master English resource file concat.lang (in the ConCat installation directory - which is normally %ProgramFiles%\JD Design\ConCat). Open this resource DLL with a tool that provides you with the facility to edit resource DLLs (such as MS Visual Studio). The dialog texts. Use your judgment to resize and reposition any controls to fit the necessary texts, but please keep the general control order, and layout the same as the original version. The string table items. These are the texts for the context menu items, prompts, and error messages. Note the use of && gives a single & character in the displayed text, and the "\n" is a new-line (sometimes occur in pairs as \n\n to give an extra blank line). Please leave any mentions of the product name intact. Add your name (and company name if relevant) to the version resource. Please let us know of any translation you do, we would like to make your work available to everyone if we can come to a mutual agreement to recognise your work. For example, you might like to have the file on your own web site and have people visit your site to advertise your other work in order to download the file.